Preparing for last year's Ebro game (see this earlier post here), created some interesting challenges when it came to producing the figures. 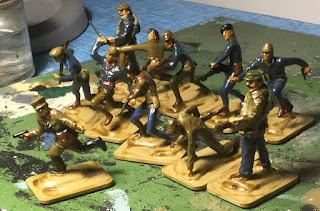 The trick I find with converting (yes OK then, bodging) 54mm figures is to apply a fair bit of imagination to what figures could potentially be. 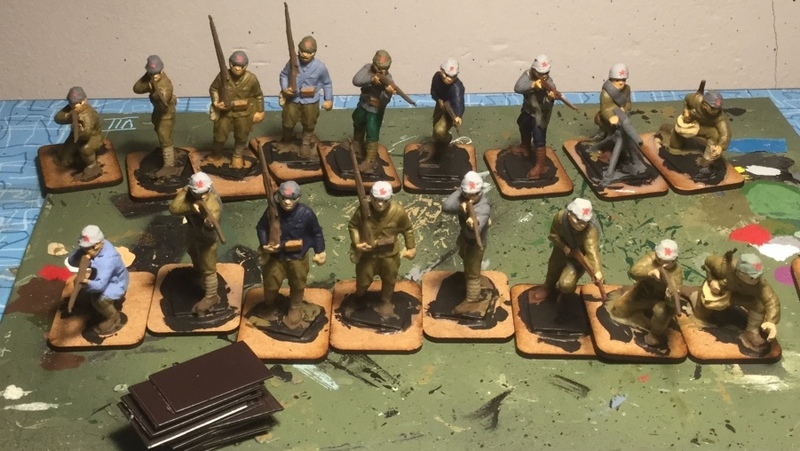 The comrades in the photo above are mostly CTS (ex-Marx) WW2 Japanese gently cut about and with some floppy Basque-type berets added from Milliput. The officer is an Engineer Basevich WW2 Russian, while the bloke in the bottom right of the photo is an ACW figure who has been subject to some knife work. I find the old Airfix WW2 Japs endlessly useful for bodges. This lot have had their caps trimmed to a rounder profile and much of the webbing carved off. 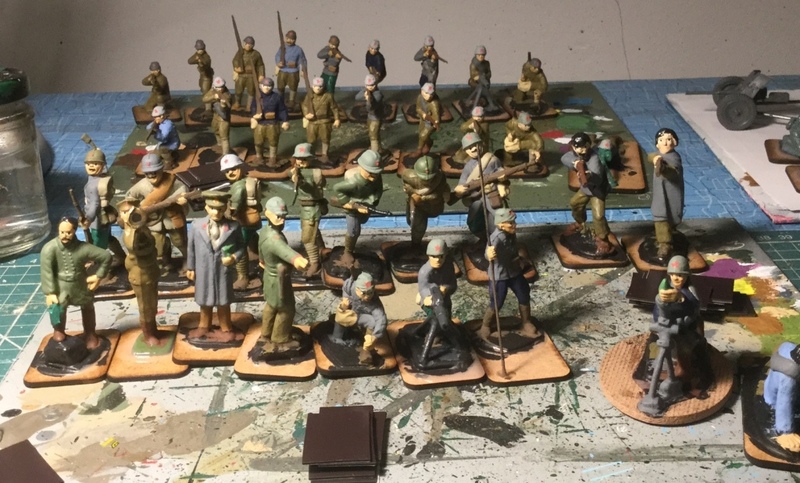 This group contains ACW figures from at least two makers, converted WW2 US from dodgy Chinese made sets found in a Belgian supermarket, Weston Mexicans and a metal Britains recast stationmaster! The Red Menace contained in their box. In our game a company is 6-8 figures so there are a couple of battalions in here. Please let me know if you'd like to see more detail of any of these figures. Are those Armies in Plastic French I see? Also finished a wire stand for my 1/48 stuka. Thank you for your help! Well spotted! I took the photos months ago so I’ve forgotten much of the detai. Great work Tim- very resourceful.